Enchanted weddings demand a wedding location that is no less than whimsical. Adding all the grace and beauty to big fat Indian weddings, sprawling and drop-dead gorgeous wedding resorts in Delhi are worth a steal.Wedding resorts are a great option for couples planning a destination wedding in Delhi. Even if you’re not, these resort style wedding venues are brilliant to give your guests a fresh breather from the typical banquet hall surroundings. If you’re planning your winter wedding already and scouting for not just best, but majestically beautiful wedding resorts in Delhi for an outdoor pre-wedding functions or wedding reception, this week we share our list of favourites with you. Check out what these grandeur-filled wedding resorts have to offer other than just spectacular stage to set your unforgettable event. Dusit Devrana is one of its kind urban wedding resorts in Delhi that promises to offer a whole new level of luxury and hospitality. Offering a fine selection of banquet spaces and outdoor settings, this resort is perfect for small to medium-sized wedding functions. Couples who are looking to host a small gathering and classier wedding affair, this wedding resort doesn’t not fail to provide excellent services. They have their own in-house caterers serving you lip-smacking cuisines. Alcohol arrangements are also managed in-house. The venue allows you to book outside decorator and DJ to set the perfect party ambiance. To book this venue, click here. 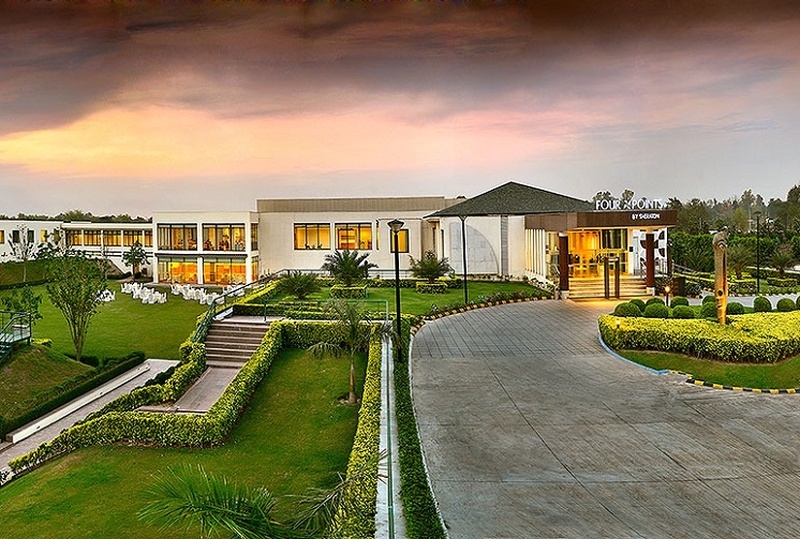 Exotically vivacious and a super deluxe creation of the Jaypee Group, Jaypee Greens Golf & Spa Resort in Delhi is one of the finest wedding venues you can find. Built on 9 acres, this super luxury wedding resort in Delhi offers meticulously designed banquet spaces that will blow your mind. The irresistible charm and incredible beauty this place has to offer will guaranteed arrest all sense of your guests. From small gathering to large size wedding, this wedding venue has a space for all kinds of wedding functions. As a full-service resort, all wedding related services, including decoration catering, entertainment and alcohol provisions are handled by their wedding specialists. Four Points by Sheraton is an elegant wedding resort in Delhi perfect to host a small to big fat Indian wedding in a chic and stylish way. Their banquet space is perfect to host small gathering pre-wedding functions, like mehndi and sangeet, while their other banqueting spaces are combined with the lawn to offer a wider space for bigger celebrations. The lush green view and exotic surrounding that this wedding venue has to offer will uplift your wedding celebration a notch higher. Four Points by Sheraton have their internal wedding specialist team who look after all your wedding related services, right from decorating the venue to match the fanfare of your wedding festivities, serving delicious multi-cuisines to foot-tapping music and entertainment facilities. Alcohol too is served in-house, outside provisions are not allowed on the premises. An avant-garde banquet space waits for you at the ITC Brand Bharat, one of the finest wedding hotels located in Gurgaon. Their Prithvi Ballroom is a distinct space perfect for both pre-wedding and wedding functions. If you wish to make your celebration an unforgettable moment, their talented team of expert planners will leave no stone unturned to transform your dream into reality. Offering a long list of customizable service options, including limitless decoration options and elegant cuisines, this venue has got you covered. Yet searching for a wedding resort in Delhi NCR? Check this out!